I'm standing at the base of one of the most legendary corners in all of auto racing, the uphill right-left sequence named Eau Rouge. I'd never driven it before but four-time F1 champ Sebastian Vettel has and he's waiting in a hopped up Infiniti hoping to crush me. Then it starts to rain. From the bottom, Eau Rouge can look like a snaking road to the heavens. As two-time F1 Champion Fernando Alonso described the infamous Eau Rouge "You come into the corner downhill, have a sudden change [of direction] at the bottom and then go very steep uphill. From the cockpit, you cannot see the exit and as you come over the crest, you don't know where you will land." Mind you, this corner is also known for being flat out in many different types of cars, and you start to understand the respect this one corner has through the racing world as a whole. As I look over the old rubber bits and debris clumped up off the racing line, from the 24 Hours of Spa the day before, it starts to drizzle, the blue skies to my left are quickly engulfed by dark shadowy rain clouds. Spa Francorchamps is infamous for its unpredictable weather as it bends itself for 4.3 miles through the Ardennes Forest, full of valleys and peaks. The rain starts to fall harder and eventually a river is running down from the top of this daunting corner down, forming a puddle at my feet. This is when I remember that growing up, sim-racing, for many years the background on my computer was an F1 car fully compressed at the midpoint of Eau Rouge, as the sun set in the distance. A brief euphoria engulfs me as I realize that, at 23 years old, I'm about to race a 4-time F1 World Champion on one of the greatest racetracks ever created. In a lot of ways we are racing SebastianVettel and also Pan Xiaoting. I will remind you that all that shameless promotion by the Jalopnik crew and myself garnered us a little more than 3 minutes to go as far as I can around Spa. That seems like a lot until you realize Sebastian Vettel was awarded 4 minutes and 10 seconds, and Pan a little over 4 minutes. So the odds are certainly not in my favor and I now know to pick my popularity contest battles a little more wisely next time as a lovely Chinese snooker player and four-time world champion. Ok so you already knew that, but what about the car? 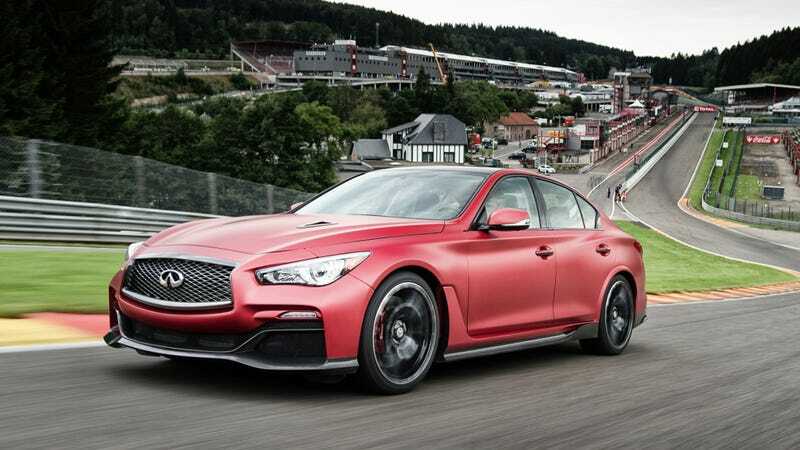 The car we we're going to be hot lapping is the one of a kind Infiniti Q50 Eau Rouge. It's the understated, elegant Q50 with exciting wings, a couple little aero bits and then the heart and insides of a Nissan GT-R slammed into the engine bay and throughout its unassuming body. It's been driven by very few people in the world, so I'm excited to be one of those few, though I know I'm only going to get a couple of laps and... even then... I'm going to be focusing on not putting this special vehicle into a wall. My first taste comes in a stock Q50 which, I have to admit, is surprisingly quick around the track. It would probably feel faster if I wasn't following a 997 Porsche GT3 and relegated to such a slow pace! After the lap I meet Sebastian Vettel for the first time and make sure to note that all of Jalopnik sends him a big hello. So, if you reading this on Jalopnik, then through some math property I don't understand you have now said "Hi" to Sebastian Vettel! As we get done with the pleasantries, Sebastian hops in the Q50 Eau Rouge that was full of camera equipment and took off! After a couple of laps he comes back to note that with all the camera equipment on he "didn't push it." I take a note of this because if the F1 driver doesn't like the cameras, they must be affecting some things. Now it's my turn; So I get in with my purple helmet they provided me. I was buckled in, engine on, ready to tackle Eau Rouge, ready to put this one of a kind prototype on the edge around Spa Francorchamps in a warm-up lap to get B-Roll footage. As I set off I get a little bit of wheel spin at the end of pitlane and realize something was wrong. It was the cameras! Sebastian was right, they're right in your line of sight, they also felt like at anything over 100mph they were going to become debris littering the beautiful Ardennes forest. Mind you, these aren't GoPro's, they're full on huge Hollywood cameras. So I putt around, disappointed with not getting to drive this car flat out, but also realizing I'm now going to have one lap to learn the circuit and capabilities of this car, while trying to beat an F1 Champion. Should be easy…. The rest of the morning is one interview after another one and I'm trying to get my head right. As if my time deficit wasn't bad enough, Vettel gets to go first. This seems like a disadvantage until it starts to rain. Hard. We're only here one day, so off he goes trying to get as far as he can in 4 minutes. Vettel flies by the pit wall at speed in conditions so bad it seems he'd be better off in a boat. He trudges on and is able to make it around for one lap and about six corners past the start finish line. He comes back in and says it's "too wet." Pan is scheduled to go next; but we wait. Eventually the rain stops, the sun comes out and Sebastian is given a second chance. In drier conditions he whips around in what was a lap of 3:10 and is able to drive one lap and 9 corners past the start finish line. Now it's Pan's turn. This young woman is not a professional race car driver. She's a professional billiards player, essentially. Those skills must be transferable because, despite lack of experience, she sets an awesome lap in variable conditions on a race track she's never even visited. She probably would have been just as home on the moon. Her lap time is 3:33 but her four minutes of time allows her to get just past Eau Rouge. Not bad at all! Finally, it's my turn. In all my years of racing I've been in situations I wouldn't wish upon my greatest enemy in terms of pressure. This isn't exactly one of those times, but damn if I don't want to be fastest. I might die tomorrow and think, damn if only I had pushed a little harder around Spa that day! So as the track is slowly drying I set off on my warm up, grateful to be going last. The Q50 Eau Rouge has one of the most subtle exhaust note-to-acceleration ratios I have ever experienced (which is a standard I just invented). Instead of being a car that has you feel like your riding a wild live dinosaur raptor, its like being wafted along on a magic carpet. As I head into the first corner I slam the brakes and realize I've braked too early and have completely underestimated the brakes on this 4-door sedan. The car isn't light, obviously, but the stopping power is impressive. It takes me a solid half a lap to realize the full braking potential. As I hit the straight I feel like I'm going 100 MPH and yet, when I look down, I'm at 140 MPH. This car had serious performance but not in a way that shouts "Look at me, I am really fast." It just goes fast. As I get back around to start my lap I make a little mistake in the last corner known as La Source but it doesn't matter as I'm now about to pass the start/finish line and start our lap to beat an F1 champion. As I barrel down the front stretch, I put the right side of the car so close to the wall the bystanders on the pit wall all jump back. I'm a NASCAR driver, it's what I'm trained to do! The last speed I see is 120MPH as I turn at the red marshal's box on the right, into Eau Rouge. As I clip the first curb I lift and let the car roll to the right hander portion where I dab the brakes to settle the front end before mashing the gas peddle to exit. As the car floats over to the left, the track is wet and the curbs are glistening with a fresh bit of water on them. No matter, I keep my foot planted on the floor and smash over the exit curbs at the top, having no idea where the car is going to land! It gets a little sideways, but it doesn't matter as I'm still going fast. This car, for some reason, wants to entice you to be sideways. I'm now hitting 140 MPH as I go through the little kink at the mid portion of what's called the Kemmel Straight. As I approach the next corner I'm over 140 MPH, using every one of the Q50 Eau Rouge's 550 hp and setting up my braking marker. First the 500 board, the 400, the 300, I hit the brakes from what has to be 150+ MPH in a 4-door road car. The car wiggles and dances, all the way to the turn-in point, where I realize I've rolled a little too much speed. The car gains a lot of understeer here but before I can process it I'm heading to the left hander and back in the throttle. For another half of the lap, I'm on edge, pushing as hard as I can. I know the clock is ticking down but I'm letting it get a little sideways here and there. I feel all my sim-racing experience here, all my racing experience in general, telling me I'm on a fast lap. So as I near the start finish line I'm hearing the count down of how much time I have left. I'm just past the start/finish line about to enter Eau Rouge for a second time (which I'm going even faster through even though it doesn't). I've decided I'm going to drive the hell out of that "cool down lap" because I know this will be was my last chance to drive Spa at least for the immediate future. I patiently wait for my lap time knowing that, while I obviously lost the competition (it wasn't feasible to think over one lap we could make up a minute and ten second difference), I could take solace in having a faster lap time. Guess what, it was. Our lap time was a 2:55, which is 15 seconds faster! While the track was certainly getting drier, and Vettel appeared to use his razor-sharp mind to drive as fast as he needed to to win, it's not every day you can say you were faster than a four-time F1 World Champion. Congratulations to everyone of you who made this possible. Today is that day! Special thanks to Infiniti for the photos/video and for letting us come along for this crazy ride.